If there is news that raises the likelihood of QE reduction, markets fall. They rise on the opposite news. We saw this all week long in all regions. For example, leading global indexes fell Monday on rising fear, then bounced back Tuesday on ECB and BoJ pledges to continue in easing mode. US revised estimated Q1 GDP disappointed, coming in at 2.4%, below the predicted 2.5% that is believed to be the minimum needed to keep the US economy from sliding into recession. US weekly initial jobless claims also disappointed, coming in higher than expected. 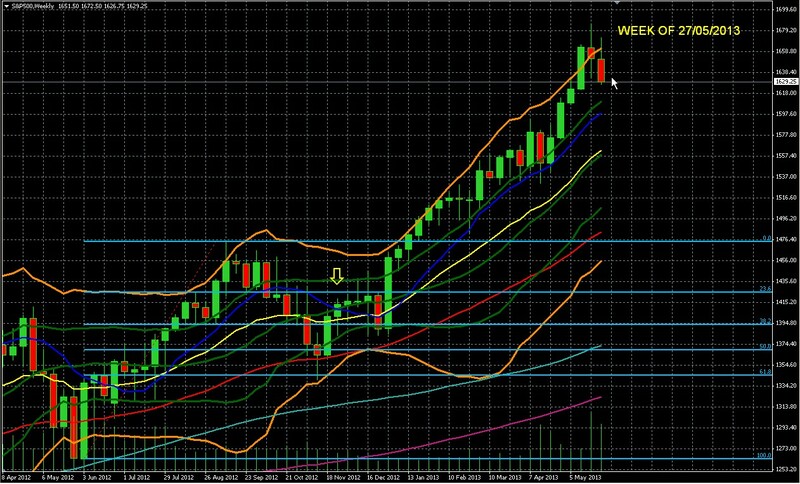 That caused European and US indexes to close higher, as the news showed that US growth continues to struggle. That kind of news eases fears of QE tapering. US data for the week continued to reflect a mixed bag of positive and negative news in line with the steady but still slow growth picture. Chicago manufacturing data beat expectations, but income and spending data were disappointing, etc. Friday’s core PCE figures showed 0% change, less than the meager 0.1% expected, so there’s no inflationary pressure on the Fed to tighten. As discussed below, continued weak global and earnings growth should further ease these concerns. We’ve mentioned before that Bernanke believes premature tightening helped bring the US Great Depression and Japan’s Lost Decade, so he’s going to err on the side of tightening later rather than earlier. On Wednesday Chinese Premier Li Keqiang continued to get the world used to slower economic expansion in China as it embarks on reform, saying the country needs an annual expansion of 7%, down from an earlier 7.5% target. Earlier in the week China had reported disappointing manufacturing data. That same day the IMF also cut its growth forecast for China. The OECD cut its world economic growth outlook to 3.1% for 2013 and 4% for 2014 from prior forecasts of 3.4% and 4.2% respectively. In its twice-yearly Economic Outlook it predicted that the U.S. will improve and that Japan will rebound, while the recession battered euro-zone will fall further behind. The OECD also warned that cuts in QE by central banks could cause spikes in bond yields and harm the world economy. Italy’s 10 year bond auction saw rates rise from 3.94% at the prior auction to 4.14%, though that could be at least in part a reflection of rising bond rates ever since QE tapering fears hit the scene and sent US, Japanese, and other 10 year note yields rising (ok, soaring in Japan’s case). Meanwhile, things continue to deteriorate in the EU’s next likely bailout case, Slovenia. Its economy contracted 4.8% in Q1, versus and expected 2.9% drop. When $85 bln of bond demand per month threatens to disappear, it’s no surprise that bond prices will fall (and thus yields will rise). That’s not good for any struggling economy. The mere threat that the Fed might cut back on bond purchases was enough to send US and other benchmark bond yields soaring this week. Unless those fears of QE cutbacks subside, bond prices will remain under pressure. That’s a particular problem for Japan. In an otherwise relatively quiet week in China, Europe, and the US, Japan’s bond yield spike has provided the most ominous cause for concern. It began in response to the news the Fed was considering curtailing QE and thus its bond purchases. That caused both US and Japanese yields to rise. Japan’s 10 year note yields remain among the lowest among the leading economies (0.85% vs. 2.16 on 10 year US notes), but it NEEDS those rates to stay down. As everyone following Japan knows, its debt levels are unsustainable; the only question is how long it can continue. John Mauldin has been putting out a number of good summaries of Japan’s dilemma at mauldineconomics.com if you want a more detailed description of the following. Japan has the highest debt/GDP, 245%, (vs. 101.5% for the US in 2012), in the developed world or anywhere else except for maybe Zimbabwe and perhaps a few other forgotten economic basket cases. In the past, Japan has managed to keep rates low because it had a huge domestic market of savers to buy those bonds and a large trade surplus that suggested Japan’s heavy debt expense was sustainable. Now however, about 25% of that population of savers is over 65 and those retirees will be net sellers, not buyers, of JGBs, and Japan has started running a trade deficit. Its debt service expense alone accounts for ~24% of that budget. A mere doubling of rates to a still low 1.7% would make debt service over half its budget. It now issues more bonds than it pays in interest. In other words, it needs to sell new bonds just to pay interest on the old ones. When the only way you can pay existing investors is to bring in new ones, that’s the basic definition of an unsustainable Ponzi scheme. Moreover, Japan is trying to increase inflation, which makes its bonds worth less and will cause its rates to rise at some point as investors want compensation for being repaid in Yen that will be worth less. Print thousands of billions of JPY to pay its interest cost, the JPY depreciates to the point of worthlessness, and then Japan defaults. Either way, the current path is unsustainable. Japan can’t promise to increase inflation to 2% and expect bond yields to stay down. The only question is how long the game can continue? Unless Japan can get bond rates down, without overprinting the JPY, then the game can’t last much longer. Japan is the third largest economy in the world, implying in short, a new contagion risk. We’re not there yet, but rising JGB bond rates get us closer. From seekingalpha.com’s market currents for Wednesday, two points worth noting. WED 3:05 AM Bank of Japan Governor Haruhiko Kuroda expresses support for allowing emerging countries to impose capital controls in order to protect themselves from financial crises. Kuroda’s view is in line with a relatively recent change of heart from the IMF, which had long been a crusader for the free movement of cash before relenting. WED 3:47 PM Depositors pulled €3.2B from Cypriot banks and €2.8B from Greek banks last month in the wake of Cyprus’ bungled bailout. Critically, the figure for Cyprus does not include the haircuts imposed on deposits as part of the rescue effort. Elsewhere, Spanish deposits fell 1.5% to a seven-month low and customers in Slovenia yanked nearly 2% of their cash amid worries about the stability of the country’s financial sector. The Fed QE hints halted the rally in global equities last week. 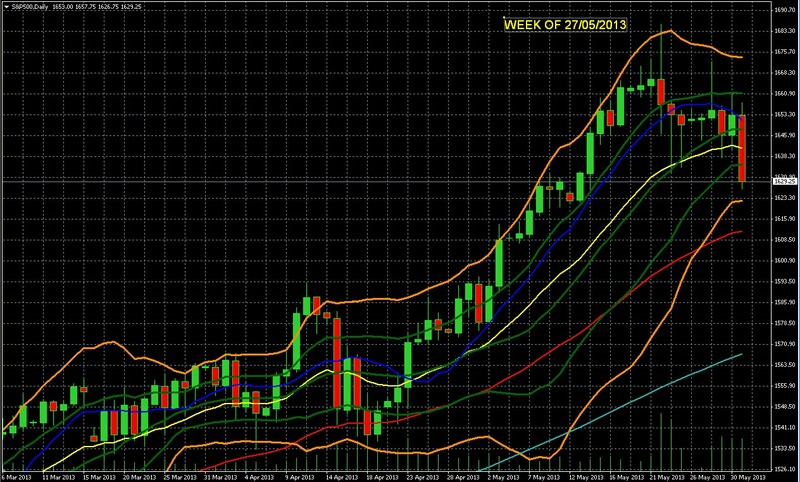 The uptrend for most major indexes is so well established that it remains well intact on the weekly charts, as shown in the example of the S&P 500 weekly chart below. However the daily chart shows more damage. For now all depends on sentiment about QE continuing. As noted above, we don’t believe the Fed will do much, if anything, because there is neither the growth nor inflation threat to justify it. That makes any sustained pullback unlikely until markets have additional reasons to do so, or actually start paying attention to the weak global economic and earnings picture. Stick to reliable dividend payers that hedge currency and inflation risk. The strong dollar has put certain foreign assets on sale. Remember that in the past weeks no fewer than 14 central banks have cut rates, as central banks remain in overall easing mode. That will cut the purchasing power of most currencies, and of portfolios denominated in them. See here for an award winning guide on how to protect your assets from being dragged down with your currency.